Innovation and attention to detail are the story with the Rena T-650 tabber. Among the top tabbing machines for sale, this is the most technologically advanced tabletop tabber systems we’ve ever offered, period. 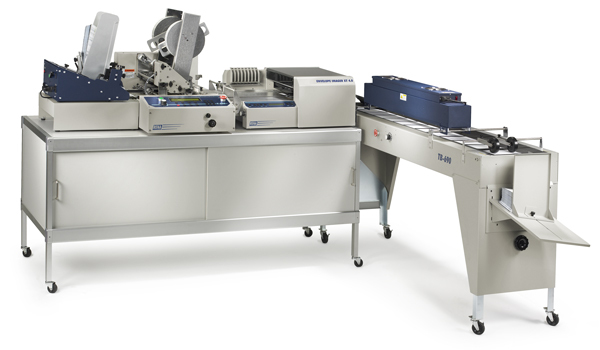 The Rena T-650 tabbing machine can apply tabs to the top and side of a mailpiece simultaneously. Even more impressive, is a single pass it can apply tabs on opposite sides of the same piece (side-to-side tabbing). 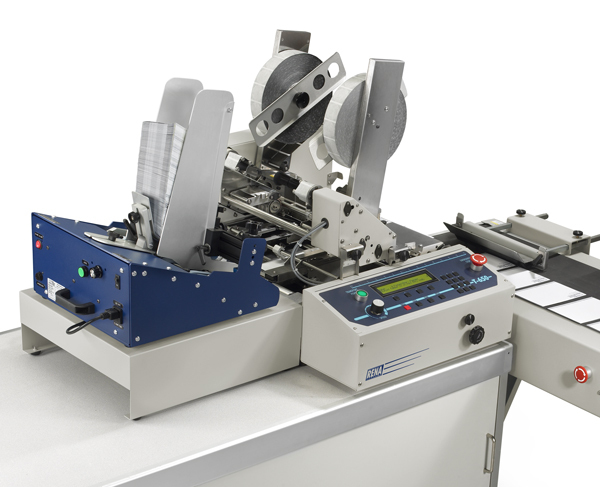 This versatile design also allows the T-650 to apply stamps, small labels and flat tabs for gate-folded pieces. The ingenious design of the Rena tabber T-650 is really two tabbers in one. The one fixed tab head applies side tabs along an open edge while the repositionable tab head is able to switch from side tabbing to front (or leading edge) tabbing. This really is one machine that can do it all. Its heavy-duty aluminum and steel construction will guarantee you years of reliable, high performance use. The Rena tabber T-650 applies clear, translucent or paper tabs with ease in a variety of tab sizes, including the new 1.5” tabs for letter-size booklets. Now, side-to-side booklet tabbing is no longer a difficult task requiring multiple passes or machines. Weather side-to-side tabbing or stamp affixing, the T-650 multi-side tabber/stamp affixer will make your job easier, more productive, profitable and efficient. Material Size Minimum (W x L): 5" x 3.5"
Duty Cycle 30 million addresses total or 500,000 per month over a 5-year life cycle.